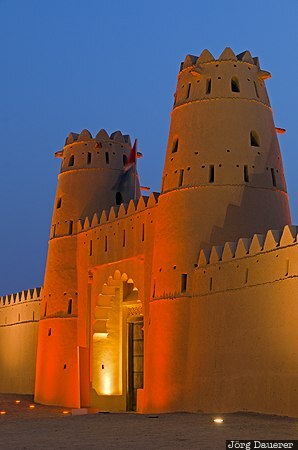 The floodlit gate of the Al Jahili Fort in Al-Ain with its typical towers at the blue hour just before sunrise. Al-Ain is the second largest city in the Emirate of Abu Dhabi, United Arab Emirates (UAE). This photo was taken in the morning in March of 2012. This photo was taken with a digital camera.